Calliope Brass is an innovative ensemble on a mission to bring stories to life through music. New York City-based quintet Calliope Brass plays repertoire ranging from jazz to classical, pops to swing, and everything in between. Since our inception in 2015, the ensemble has been inspired by the power of storytelling through music. Calliope Brass is proud to debut our educational initiative “What’s Your Story?” for the 2018-2019 season. 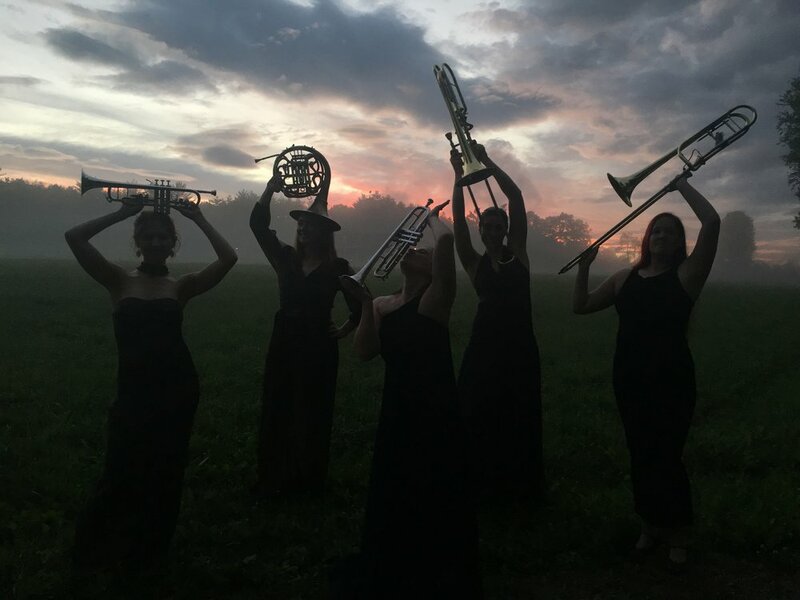 The show is a cross-curricular interactive performance, reinforcing K-5 English and Language Arts core content while also teaching students about musical terms and concepts, and the instruments of the brass family. The show’s final form features an original modular score by Broadway composer and “Hamilton” national tour Associate Music Director, Kat Sherrell. This unique piece of music is designed to be played in any order to provide cinematic-like underscoring to stories so that we can customize each performance and perform stories written by students in the audience. Listening to their stories brought to life is an extremely affirming and exciting experience for students. Our narrator is "Calliope" the puppet, an original character played by all-star Sesame and Muppet puppeteer, Haley Jenkins. Calliope Brass worked with Haley and Sesame Street puppeteer Leslie Carrara-Rudolph (Abby Cadabby) to develop the puppet design and character. "Calliope" takes on the role of a childlike dragon-fairy who excitedly leads our young audience members through an exploration of the brass family of instruments, and how music can be used represent characters, emotions, and settings in a story. Calliope Brass also develops larger projects combining original documentary film, live actors, guest artists, and original composer interviews to create an immersive storytelling experience. Combining the traditional brass quintet with a variety of guest performers, we present the narrative through a new medium by drawing upon personal experiences, traditional pieces, new commissions, and innovative arrangements to tell our stories in an exciting and engaging way. Our first project focused on storytelling through music is a multimedia experience entitled “Portraits of the Underdog”, which premiered in April 2015. For this production, Calliope partnered with composers David Maslanka, David Sampson and a professional video team to combine music and documentary film. We focused on telling little-known stories of the struggle against bias from a variety of unique perspectives in a moving and profound way. This presentation is geared towards older student and adult audiences. In addition to our story-focused programs, Calliope Brass is also active in presenting recitals. In 2017, we received a seed money grant from New York Women Composers to program a recital of contemporary works, many of which were written by members of New York Women Composers group. This concert included the premiere of a 5-movement work for brass quintet by Faye-Ellen Silverman. 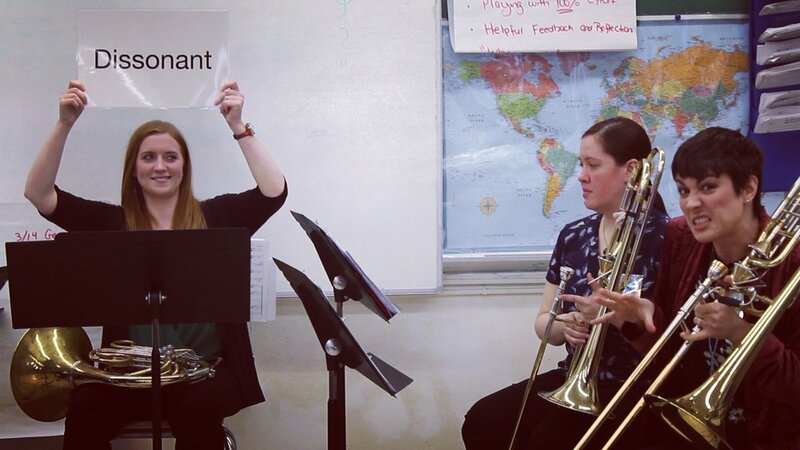 Calliope Brass is committed to excellence in performance and educational initiatives, in order to further the role of women brass musicians as both artists and teachers. Members are versatile musicians found playing in Broadway pits, major symphony orchestras, the Amazon series Mozart in the Jungle, mainstage acts including Adele, Pink Martini, and Andrea Bocelli, and sharing their artistry in schools nation-wide. Calliope Brass is committed to providing interactive, engaging experiences with brass playing for all students. “Every Sound Tells A Story”… And we want to hear them all! Out of all of the enrichment and guest presentations we had during the year, this was by far the most inspiring and engaging for all of our students, grades preschool through sixth grade and teachers alike. Apply for a performance grant here! Calliope presents one of several recital program options as part of school engagement, customized to suit audience tastes. Prepare advanced students for solo and ensemble competitions through masterclasses with one, several, or all of Calliope's members! Calliope works with school bands and orchestras, individual sections, or full brass complements to improve fundamentals, musicianship, and performance. Working with a limited budget? Apply for performance grants here! We fundraise year-round to help schools of all means afford quality arts programming. What dollar amount would your program need to fund a performance? In the summer of 2015, Erin, Rebecca, and Jean found themselves floating on the Harlem Meer. 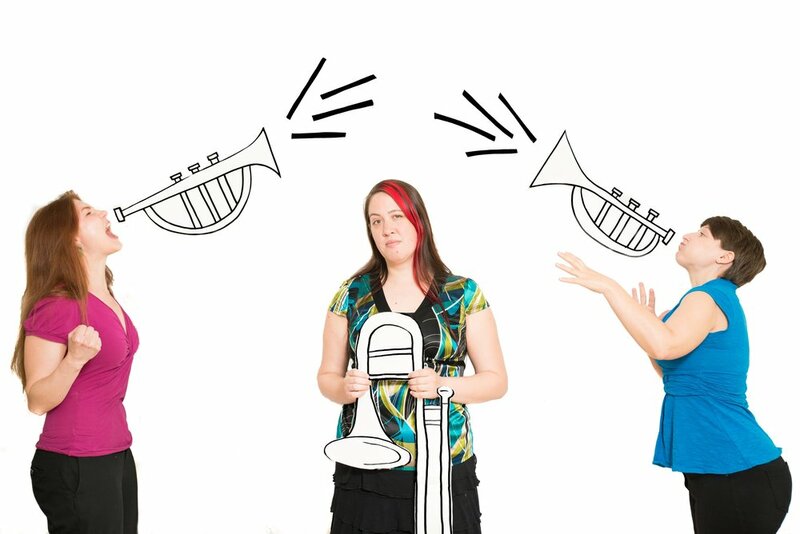 The women discovered they shared a vision: To start a brass quintet made up of all women players, without emphasizing their gender. Instead of viewing a brass quintet comprised of women players as a novelty to be discussed, we'd like to serve as role models simply by existing. 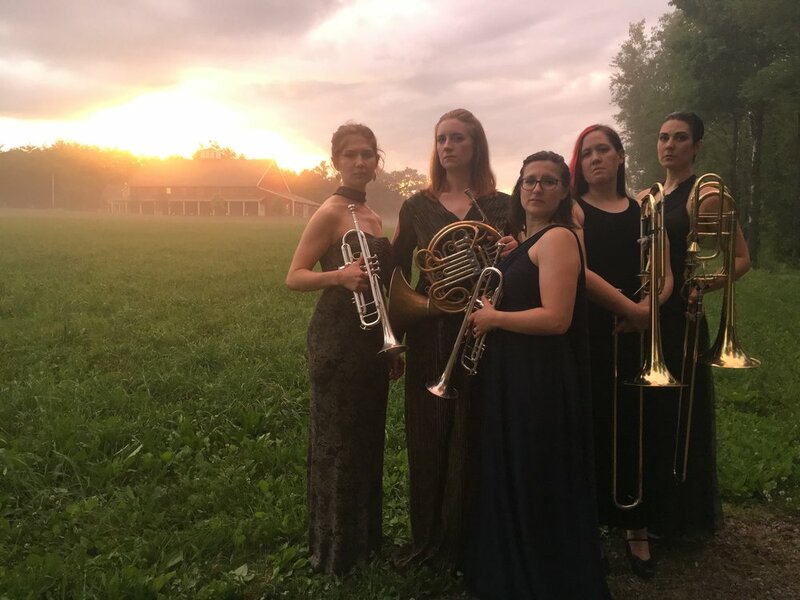 We're a professional brass quintet, and we happen to be women. Trumpeter Rebecca Steinberg, originally from Litchfield, CT is an active New York City freelancer. Rebecca has performed at Carnegie Hall, Lincoln Center, Radio City Music Hall, and Symphony Space. She is a founding member of Calliope Brass and is the trumpet chair of the Off-Broadway production “Di Goldene Kale,” which is hailed as a New York Times Critic Pick. Ms. Steinberg recently performed in the orchestra of Adele’s Radio City Music Hall Special, which aired on NBC in December 2015 and regularly performs with the Bergen Symphony, String Orchestra of Brooklyn, Chelsea Symphony, Metropolis Ensemble and the Manhattan Symphonie (with whom she performed on two recent tours to China). As a soloist, she performed the Haydn Trumpet Concerto with the Torrington Symphony (CT). You can hear her on Mimesis’ Ensemble's debut CD released by Bridge Records and on the album “Sounds of the Scrolls” released by Washuum. You can watch her as an orchestra member of the show “Mozart in the Jungle,” which won the 2016 Golden Globe in the Best Television Series, Musical, or Comedy category. A graduate of the Manhattan School of Music with a Masters in Trumpet Performance, she studied with Thomas Smith and Vincent Penzarella. Dr. Kate Umble Smucker is a trumpet player and music educator based in New York City. She currently teaches trumpet, theory, and brass ensemble at the Music Conservatory of Westchester and plays with Calliope Brass Quintet. A versatile musician, Kate has also performed with the Allegro Chamber orchestra, the Lancaster Symphony Orchestra, the Fulton Theater pit orchestra, and the Lancaster British Brass Band in Lancaster, PA. She served on the music faculty of Millersville University and maintained an active private teaching studio. Kate is a dreamer who loves to bring big ideas to life. Working with Calliope Brass, Kate assisted in the development of the educational show, "What's Your Story?" She is a founding member of Spark Brass, a brass and percussion ensemble dedicated to promoting the value of music education. She is also the founding artistic director of Lancaster New Sounds, a concert series that showcases new music by living composers. Her love of jazz prompted her to put together and lead the 18-piece King Street Big Band. 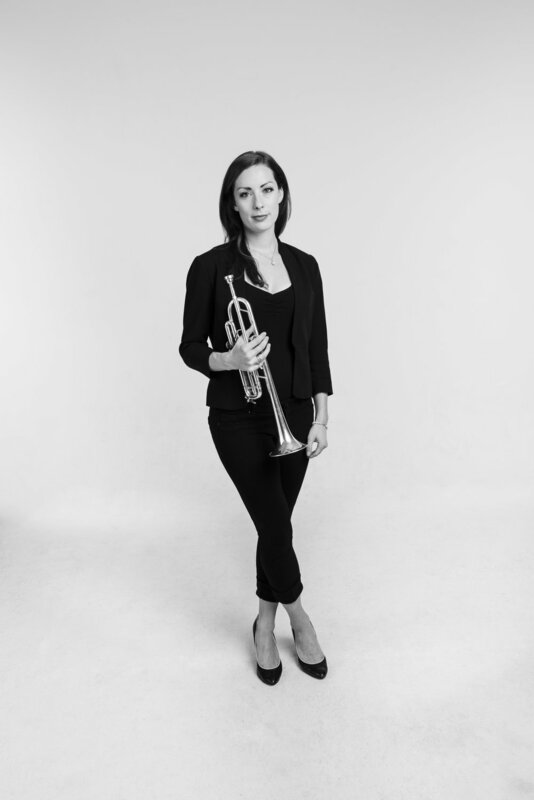 Kate holds a Doctorate in Trumpet Performance from the University of Missouri in Kansas City, a Master of Music from the University of North Texas, and a Bachelor of Music Education (K-12 instrumental) and a Bachelor of Music in Trumpet Performance from the University of Northern Colorado. Her primary teachers were Dr. Keith Benjamin, Professor Keith Johnson and Dr. Robert Murray. 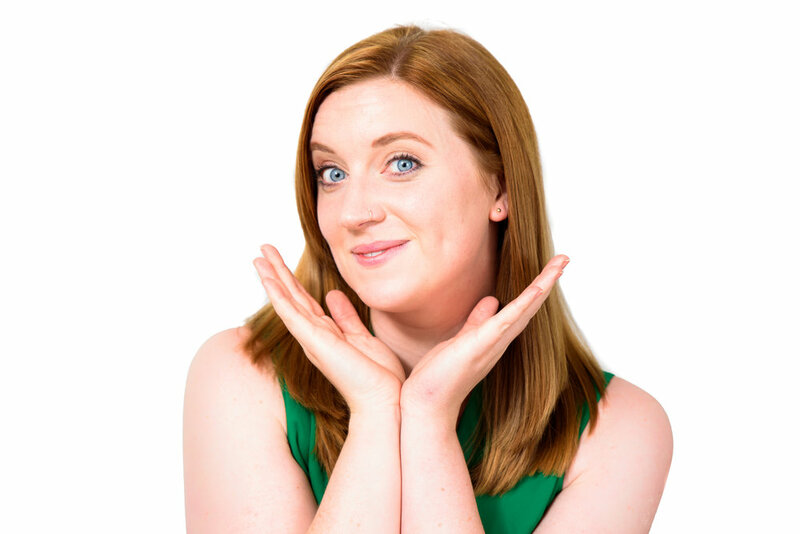 Currently a freelancer in New York, Erin has performed with ensembles across the globe, including the Sarajevo Philharmonic, Florida Grand Opera, Opera Tampa, Washington Heights Chamber Orchestra, Las Vegas Philharmonic, and Chamber Orchestra of New York. She has appeared with major artists including Andrea Bocelli and Josh Groban, and subs in pit orchestras on Broadway. Erin studied with Daniel Grabois and Peter Reit at The Hartt School, and with Bill Bernatis at the University of Nevada, Las Vegas. Erin is on faculty at Kent Place School and the Horace Mann School, and maintains a private horn studio. Sara Mayo is an active freelancer in New York, and is originally from the Pacific Northwest. She is the Principal Trombone of the Yakima Symphony, and has been a featured soloist with both the Yakima Symphony and the Tacoma Community College Symphonic Band. She has also performed with a variety of orchestral ensembles such as the Chelsea Symphony, Spokane Symphony, the Pacific Northwest Ballet, the Tacoma Symphony, Northwest Sinfonietta, the Lake Washington Symphony, Ballet Bellevue, and the Olympia Symphony. In addition to orchestral playing, Sara lends her talents to groups in a wide range of musical styles. She has performed in the pits of Broadway-style musicals with the Seattle Gilbert and Sullivan Society and has made frequent appearances with the Jim Cutler Jazz Orchestra and the Jay Thomas Big Band. She has played new music with groups such as the Seattle Modern Orchestra, and also enjoys playing klezmer music, having made many appearances with the UW Klezmer Band. Jen Hinkle is a unique, bold, and versatile bass trombonist who is committed to blazing new paths in the ever-changing landscape that is professional musicianship. As one of the most in-demand NYC freelancers, Jen can be seen playing with the Afro Bop Alliance Big Band, the Dan Pugach Nonet, and the Mod Society cover band. She also regularly performs on demand in many Broadway shows in the theater district, including at Wicked, Aladdin, and Beautiful. 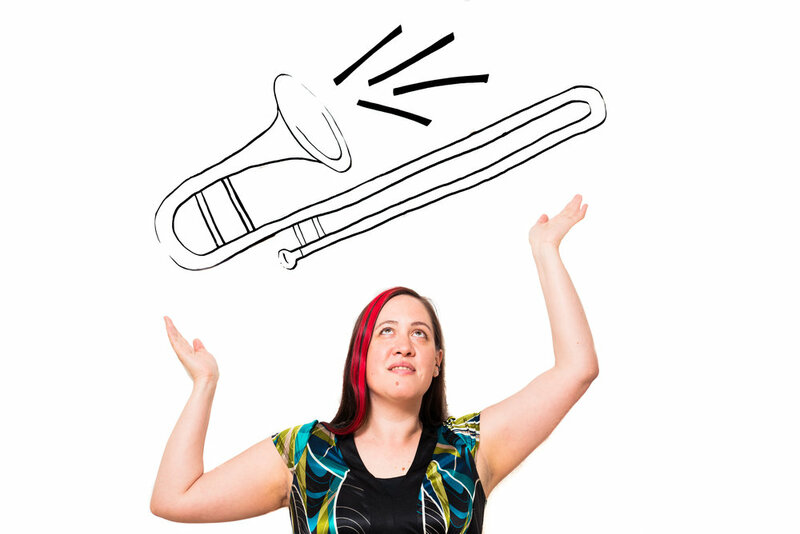 As the bass trombonist and Artistic Director of Calliope Brass Quintet, Jen is constantly trying to find creative new ways to bring the arts to the people. This goal is prominently on display with the group’s signature piece “What’s Your Story?”, which is an innovative new children’s program that blends professional puppetry, storytelling, and cutting-edge music into the standardized English Language Arts core curriculum. Jen formerly held the position of bass trombonist with the Spokane Symphony. She left to pursue her dream of starting new and exciting projects of her own, but continues to perform classically and has played with many orchestras – including the Seattle Symphony, the Oregon Symphony, the Pacific Northwest Ballet, and the New Haven Symphony. Jen lives in Manhattan where she enjoys painting, freelance modeling, and riding her horse, Sierra. She and her lead-trumpet-playing husband have two cats and are profoundly grateful for the incredible noise tolerance of their neighbors. Jean Laurenz is a founding member of Calliope Brass. An eclectic musician who loves variety and collaboration, she is an alum of Ensemble ACJW, a fellowship program affiliated with Carnegie Hall, Juilliard, and the Weill Music Institute. As an active trumpet player, she has performed all over the world with various ensembles including the Hong Kong Philharmonic, The Knights, Chamber Music Northwest, and New York Symphonic Ensemble in Japan. She has worked with major artists such as Adele, Kanye West, American Idol winner Lee Dewyze, and the New York Philharmonic. Jean is also a passionate vocalist and has performed the national anthem and other musical services at most major sporting arenas in Chicago, including the Chicago cubs, the Blackhawks, and the Chicago Fire. As the primary Bugler and Anthem Singer for the international Arlington Race Track, Jean has also made television appearances for shows including Undercover Boss, ESPN, and ABC morning news. When she is not performing, Jean shares her passion through teaching and interacting with her local community. Jean holds degrees in trumpet performance and Choral Education from Yale University and Northwestern University. Calliope Brass is a 501(c)3 non-profit organization. Your donation allows us to bring high-quality music education programming to schools without significant arts funding. Our performance grant program helps us say “yes!” to interested schools, regardless of their program’s ability to pay. Questions? For more information, contact us at info@calliopebrass.com.